Spec 6: module title will be in a hidden form field, retrieved by GWT, and displayed using GWT. Spec 7: module learning activities will be comma separated in a hidden div or form field and displayed using GWT. But where does it get these from? The controller places the course details in a hidden input field. GWT retrieves this data, and layouts the form for us. Hence, our problem, will the jsp be able to print all the learning activities in the hidden input field before gwt tries to retrieve them? To cut the long story short, I never found out what happens on the server when you request for a jsp but I do one thing, jsp loads first before gwt can do it’s thing. I am currently trying to figure out how to bind our forms to the command object used by our SimpleFormController. I have a form where I have two fields that I can add as much as I can. Think of it as like the upload file in gmail where I can add 1,2,3… files to upload only that I have two fields. I am not so sure how this will check out using a SimpleFormController in Spring. 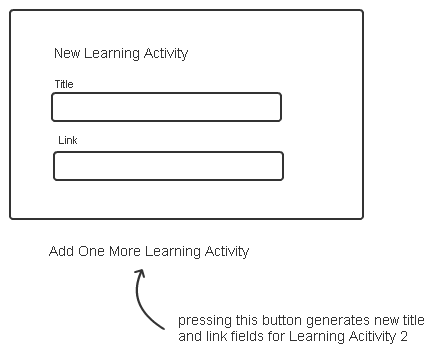 A user can add any number of learning activities to a course he makes. This makes our form “dynamic” or should I say “non-deterministic” in terms of the fields it has. But what if I wanted to print a whole lot of other things? This is inevitable if I want my web app to be dynamic.